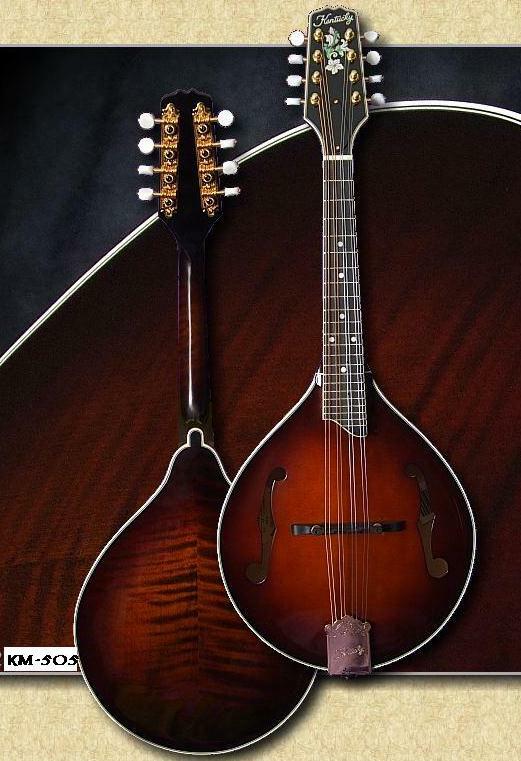 • Solid, hand-carved and graduated select spruce top. • Solid, hand-carved select highly flamed maple back and sides. • One piece maple neck with dovetail neck joint. • Radiused ebony fingerboard with M.O.P. dot position markers and modern extension over the body. • Bound rosewood peghead overlay with Kentucky script and “Mountain Rose” inlaid in pearl. • Vintage-style ebony bridge with small adjustment wheels. • Traditional 2-screw truss rod cover. • Highly polished nickel silver frets. • Gold-plated tailpiece with leather insert. • High-quality, gold-plated Gotoh tuners with engraved plate and removable buttons. 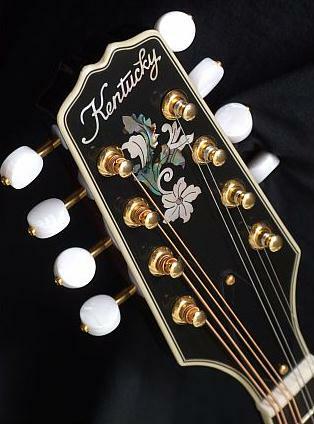 The Artist line of Kentucky mandolins has been expanded to include perhaps the best value in a professional-quality A-model mandolin. Every feature of the KM-505 was specifically chosen to meet, not only the demands of the beginning player, but also the demanding requirements of working professionals. Fine solid spruce and solid flamed maples are hand-selected at this level to assure that every instrument looks as good as it sounds.